A couple of weeks ago I was doing a favour for a friend who is moving to town. He’d bought some furniture in an online sale, and I was picking it up for him to store in my garage until he’s found somewhere to live. While I was there, I noticed a beautiful old standard lamp, sitting in the corner. It was a deceased estate, and when I asked the lady clearing the house out what she intended to do with it, she answered she was going to throw it out. I offered her ten dollars. She accepted on the spot. The lamp had a very ugly, tatty old orange lampshade. So yesterday I went to my local hardware shop and picked up a simple cream shade to replace the old one. Not an ugly duckling any more…and no longer destined for the junkyard! I don’t know where the lamp came from, but I know they don’t make furniture like this any more, not in my price range, and certainly not for ten dollars! 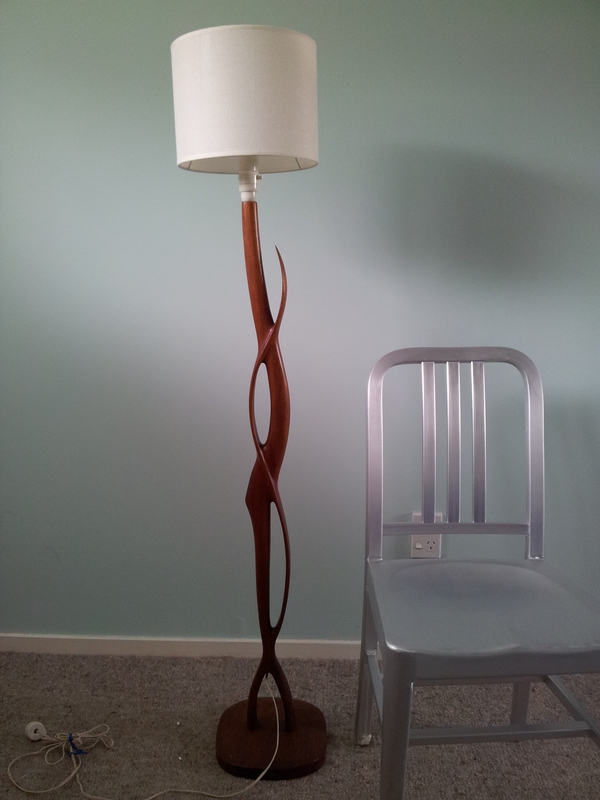 The stem is carved into entwined tree branches, and is solid wood. I think it’s quite lovely, and would guess it dates from the 1960s or thereabouts. Possibly earlier. Any ideas? It will now take a proud place as my reading lamp in my new home. For want of a new hat, this old trash became a new treasure. Simplicity isn’t just about removing the unnecessary. Sometimes it’s about seeing beauty by just opening our eyes.